Matek's mini power distribution board (PDB) has been engineered to provide the highest possible performance and reliability in a 36*36mm, 4 layered PCB. The power hub distributes power from a battery pack to 4 ESCs, as well as providing regulated 5 and 12 volt DC power outputs for powering electronics such as a flight controller, camera, servos, video transmitter, LEDs, etc. Both BECs are compatible with 2-6S LiPo. The 5V BEC is rated at 3amps continuous and the 12V BEC can provide 2 amps continuous. The board has dedicated connections for a FPV camera and a FPV video transmitter (VTX), with solder jumpers that let you select their output voltage (5/12v). So you can use a 5v camera with a 12v VTX, or a 12v camera with a 12v VTX. The board is a standard 36mm sized PDB, so you can stack it cleanly with the CC3D, Naze and most other board type flight controllers. 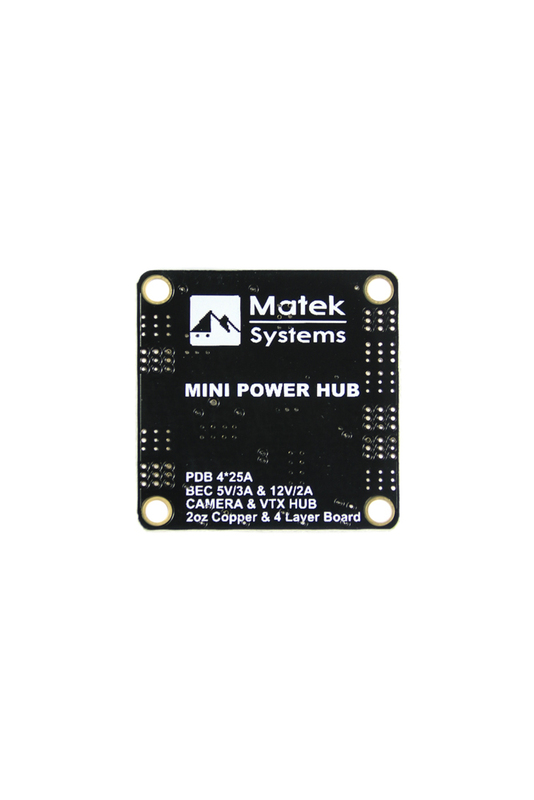 If you require a smaller PDB, Matek's micro PDB has all the functions of this PDB, except for the dedicated FPV connections. DC/DC synchronous buck regulator, efficiency is up to 95%. Standard output designed to power cameras and video transmitters,etc.